members of the Security Council, the Organisation officially came into being. While the 70th year of the UN has provided plenty of opportunity to analyse whether the UN has actually succeeded in this endeavour, it is clear the UN can bring a degree of unity across the globe like no other organisation. 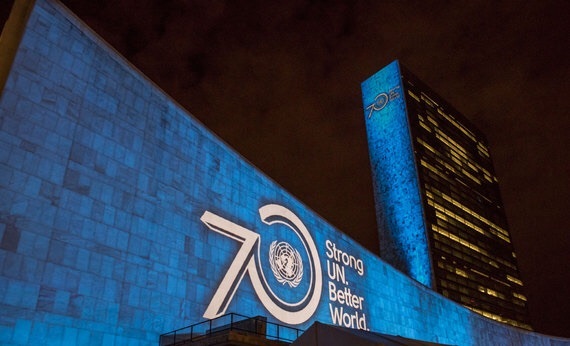 To celebrate the 70th anniversary, some 300 sites around the world lit up in UN blue. From the Great Pyramids of Giza, the statue of Christ the Redeemer in Rio de Janeiro, the Great Wall of China, Russia’s Hermitage Museum, and the ancient city of Petra, for one night the world was awash with UN blue. stood out as the only icon to project the UN logo. The event was held with the cooperation of the Anangu people and was the first time an image had been projected onto the rock face. The Anangu people held their own celebration this weekend, marking the 30th anniversary of the return of traditional land, including Uluru and Kata Tjuta. that belongs to us all.